Last week, as much as 20 inches of rain fell in some parts of Louisiana in less than 48 hours. One of the hardest-hit parishes is Tangipahoa, where the very busy and effective Ginger Ford Northshore Fuller Center for Housing is based. Ginger Ford Northshore Executive Director Tamara Danel was raised in nearby New Orleans, where flooding has always been a common occurrence. But she says she has never witnessed flooding like this. 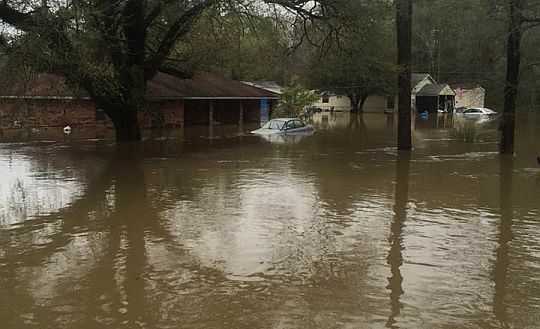 In Tangipahoa Parish, more than a thousand houses took in water and more than 2,800 people had to be rescued by boat. 100 percent of donations made to our disaster fund will go toward helping these families rebuild their homes and their lives. Scenes like this are all too common in Tangipahoa Parish, where more than 1,000 homes took in water from last week’s massive rains. Our friends at Ginger Ford Northshore do an outstanding job and already had committed to one new home build, two ReNew projects and at least 25 Greater Blessing repairs before this flood struck. Those ambitious plans already had stretched their 2016 budget thin, and they currently do not have the money in their budget for this recovery effort. But this outstanding Fuller Center covenant partner stands willing to help flood victims if we can simply help them raise the money to do the job. So let’s do it! Let’s extend that helping hand to families in need! The Fuller Center for Housing helps families in need of a decent place to call home. That need becomes stark when disaster strikes, disproportionately affecting the most vulnerable among us. As the floodwaters recede in Louisiana many families are facing great hardship, especially those who were uninsured and don’t have access to the resources to repair their homes. We will be reaching out to these families, and we need your support. Remember, 100 percent of donations made to our disaster fund will go toward helping these families rebuild their homes and their lives.